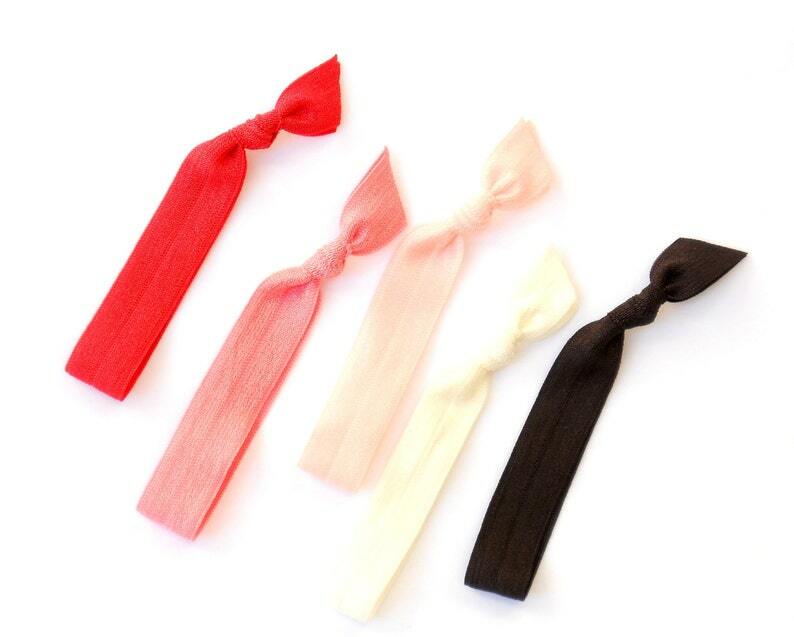 This listing is for a set of 5 comfort elastic hair ties - one of each color: Ivory, Ballet Slipper, Coral Red, Shell, Espresso (last picture is reference for packaging). Great for all hair types - made with super-soft elastic so they’re gentle on your locks, while thwarting those nasty snags and dents! They also have a dual personality by serving as wrist bands/bracelets when not in use for holding back those gorgeous tresses. Created and packaged with the utmost pride and care by me in a smoke & pet-free studio located in the good ole USA. It is my goal to have elated customers, but should you find something gone awry, I am more than happy to work out the problem. Please contact me to discuss the issue. Customer service is very important to me - I like to receive good customer service and I also like to give it. Currently, processing is 1-3 business days - generally, turnaround is very quick! Orders ship from Florida via USPS First Class Mail - generally 2-3 business days. I also offer faster shipping upgrades that you can add to your cart prior to checkout. If you need shipping via UPS, please contact me first... This is possible, however, arrangements must be made. The ship-to address on the Etsy order is where your purchase will be shipped. Please be sure to enter accurate information. If you realize that a mistake has been made shortly after your purchase, just contact me and I will work with you to fix the situation. Orders are shipped via USPS First Class International Mail. Customs forms are completed as item(s) being "MERCHANDISE" - not "GIFT" and I will not change this policy, nor will I adjust the monetary value of the purchase. Thank you for your understanding. We cannot be held responsible for lost or stolen packages. A tracking number can be provided, and if you'd like insurance for your purchase - please contact me prior to placing your order for a quote.